One hundred years ago, the world that had been at war, now, was no more. Armistice Day. How we would like to like that word even more now than they did then, knowing it had been the war to end all wars, and we know instead it was not. As we speak, we know that a war in Yemen, is causing a catasrophe as great, or worse, than the catastrophic war in Syria, that more or less continues. And the unspeakable, untold, yet often told, horrors of the Second World War, are yet in the mind, as, yes, even now, some, a few, seem to think that it is to add to our discourse, to question, or deny, the extent, of the Holocaust, rather than the truth of what they do, in doing that, adding to the horror, with a denial of the truth and a desecration of the memory of those who suffered the ultimate outrages of war, the victims of the purveyors of the cause of it, evil. There are some, a few, who think war should never be fought. There are some, or many, who know it should not be sought.There are, amongst us, the most of us, who feel that it must be and is, the necessary last resort. The last post is played , the poignant bugle , the lonely sound, as we remember the fallen. So too, now, in my country, the poppy is worn, and grown, and viewed, as a symbol, of the poppies that grew in the fields at Flanders, in that war that was called Great, not so much because it was great to fight that war, but for it's size and importance. There are some, a very few, who trash the symbol of the poppy, with their rhetorical flourishes, that symbolise, far less, than this subtle flower does, and they do so for their utter and crass misunderstanding, of the symbolism. I do not mean the some, or few, who choose to wear the white poppy, no, that is a leading in the direction of a peace that is bordering on a pacifism, but is a respecting of the memories of the soldiers, and in no way a trashing of their efforts. Those who do not understand the meaning of the poppy, should. 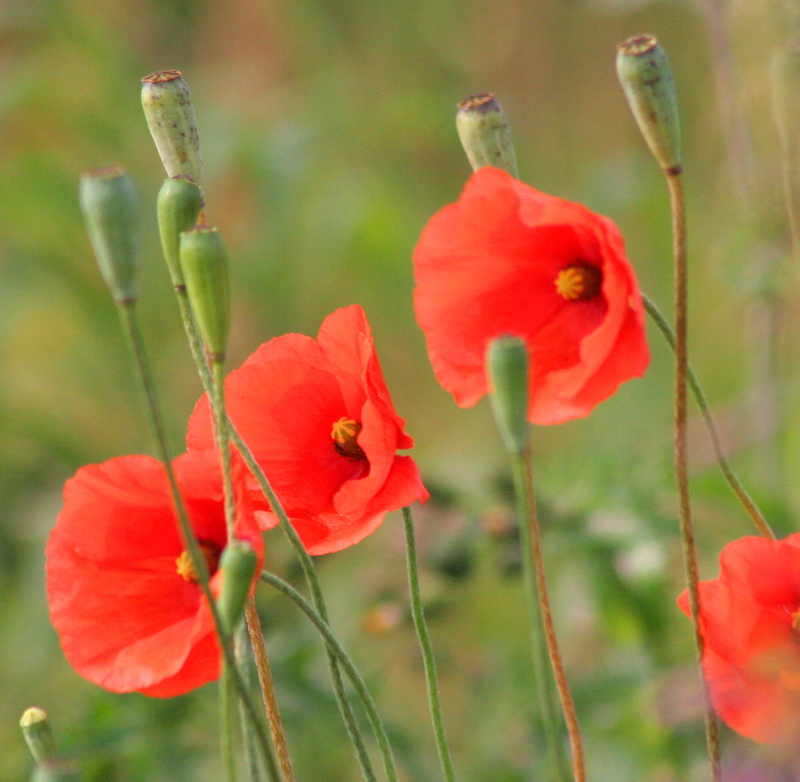 The poppy grew in Flanders , in the fields, and the red poppy came to seem as the blood of the fallen. Blood, like the feelings that we share, like the yearnings that we have, runs deep inside us. We honour with thanks, we salute with humility, we try with effort to be far better, and though we fail, we continue the work to be worthy of the sacrifices of many for the freedom of all, and we, those with common sense and a sense of our common humanity, know that the poppy, the real flower that grew in the fields of Flanders and is a symbol of the blood of thousands, millions, lost but loved, and that blood, like sweat and tears, comes from within, and knows no race, other than the human race of this world, shared with the animal kingdom we are a part of, and knows no colour, other than the colour red of the blood, shed in that field. There is greatness in war, as in peace. As in that great book, by Leo Tolstoy, that had the Napoleonic wars as their background, so too in the poems of the great war poets Wilfred Owen or Siegfied Sasoon, in the middle of the Great War. It was not too long before another war, the civil war in Spain, inspired the Guernica painting by Pablo Picasso. And then, in the Vietnam War, the song "Where have all the flowers gone?" by Pete Seeger, was often sung. The flowers have not gone, even if the soldiers they commemorated are gone, but not forgotten. Indeed , in war, as in peace, we see the efforts of the great and the good put to their greatest effort, in the service of the greater good. It is the goodness that comes from the greatness, that we must hold most dear. La vie d'un enfant réfugié, une seconde par jour!